You may not know this, but many people actually have a very hard time deciphering popcorn labels. After all, most of the nutritional info pertains to UNPOPPED kernels. And who on Earth eats those (except for us when we're desperate and get to the bottom of the bag)? Well, the popcorn experts at Jolly Time are shedding some light on this subject. Tracy Boever, a popcorn specialist and PR exec at the company explains that the FDA requires them to list nutritional info for popcorn in its unpopped state, and, for ONE CUP in its popped state. So now the company is teaching consumers how to read their boxes. 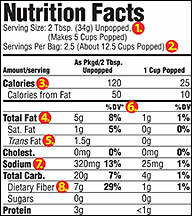 To get true nutritionals for a serving of popcorn, simply ignore all of the "unpopped" nutritional info, and multiply all the "popped" numbers by FIVE. It's not that complicated really, but you'd be surprised how confusing it is to people. Still confused? Click here for a detailed explanation from Jolly Time. Ever dream of having your very own fancy schmancy Hollywood trainer to work out with? Now you can. The workout masters over at GYMp3 will put personal trainer, Greg Isaacs, inside your head, with workouts you can download to your iPod or Mp3 player. Easy to use and for all fitness levels, you can grab a workout (complete with pumpin' music!) that you can use at the gym, or outside. Each one comes with a companion guide with step-by-step instructions, so there's no need to be nervous (seriously). FYI, Greg, a trainer-to-the-stars, has helped shape the bodies of celebs like Kurt Russell, Goldie Hawn and the cast of Friends. For more info on GYMp3, or to find out how to download one, check out GYMp3.com. Jell-O Sugar Free Double Chocolate & Creamy Caramel Pudding - Like Jell-O's other SF pudding flavors, these new ones have just 60 calories. Sounds AWESOME to us! Totino's Lean Pizza Rolls - With 40% less fat than Totino's regular pizza rolls, we're excited to check these out. Has anyone out there seen these? Let us know! Yoplait Light Thick & Creamy Yogurt - Super-creamy, 100 calories and fat free...YUM! Snapple - new juice-infused tea bags in four flavors: Le-mmm-on, Wild 'Bout Berries, Orange-Inality and Strawberry. Yowsa! According to a new study, limiting the number of flavors you consume during the day could be an effective way to lose weight. Dr. David Katz, director of Yale University's Prevention Research Center, says that eating lots of flavors in one day leads to overeating because the brain doesn't process the "full" signal. His theories are explained in the book The Flavor Point Diet ***Trader Joe's, the famous affordably-priced specialty market that features oodles of good-for-you foods, is coming to Manhattan. With 250 stores in 19 states, Trader Joes is one of the fastest growing markets in the country. ***The FDA is warning people NOT to take two unapproved Brazilizan drug products sold online for weight loss. These products are Emagrece Sim (aka The Brazilian Diet Pill) and Herbathin. Both could cause serious health issues, so BEWARE. Did you miss the HG Tofu Shirataki on Extra last Friday? Check out the segment here. That's all we've got. HG out. Fewer Flavors = A Dieter's Dream? Share this news with everyone you know...Click "send to a friend" NOW!! !